medi ROM Walker / medi Walker boot is lower leg brace. The product is exclusively to be used for the orthotic fitting of the foot and only on intact skin. Controlled compression by anterior and posterior shell as well as circular hook and loop fastener straps. First open all the hook and loop fasteners and the leg/foot padding. Place your foot in the padding so that the heel stands firmly in the pre-formed heel bed and close the padding. Patients with very slim calves can trim the pad to the right length using scissors if there is a large overlap of the padding. Place your foot in the rigid shell of the Walker. The two guide supports should lie exactly along the middle of the inside and outside of the calf. Then close both the hook and loop fasteners of the foot section and the back heel strap. Finally fasten the three leg straps from the bottom up. Make sure that the straps lie flat against the pad and are tightly closed at the front. However, be careful not to impair the blood circulation. For additional stabilisation of the lower leg the enclosed plastic shells can be fixed to the pad. The broader one is intended for the calf area. The padding can be used for additional cushioning (e.g. across the instep, at the heel strap, between the ankle bone and joint). How to use our medi ROM Walker lower leg orthoses. Date of issue: until November 2017. 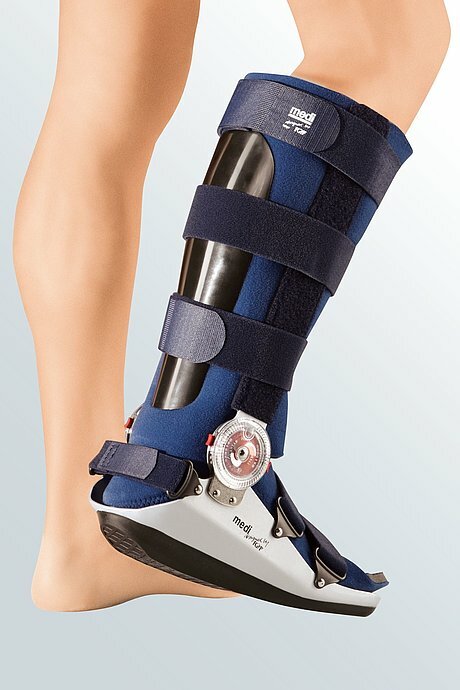 How to use our medi ROM Walker / medi Walker boot lower leg orthoses. Date of issue: from November 2017.